The Hugh Hodgson School of Music’s brass department features internationally recognized faculty, including our most recent appointment of Philip Smith, former principal trumpet of the New York Philharmonic. Brass students from around the world come to study with our renowned faculty, having numerous opportunities to play in various ensembles within the School of Music. Students have opportunities to play in large ensembles such as the band, orchestra, and jazz band, and also have chamber opportunities including various small instrumental ensembles. The fully funded graduate brass quintet, the Bulldog Brass Society, is active both around campus and the community. Weekly masterclasses provide the students with ample opportunities to perform, visiting guest artists provide inspiration, and a newly formed brass band create boundless opportunities for the motivated student. 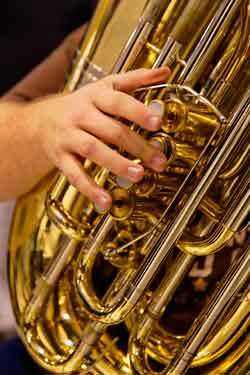 The brass area pride ourselves on giving individual attention to every student. All music majors study with their major professor rather than a teaching assistant, and studio trips to various festivals and competitions are commonplace amongst our studios. Please feel free to contact any of our brass faculty for further information about UGA, and we hope to see you in Athens in the future!